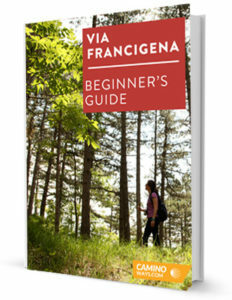 The Via Francigena beginners ebook will provide you with all of the information you need to know before embarking on the Via Francigena walking route. This ancient route,connecting Canterbury to Rome, is speckled with the most beautiful landscapes, villages and scenery throughout. Whether you are planning a walking trip to Rome, a walking tour in Italy, a pilgrimage in Europe or a spiritual journey along the Via Francigena walking routes, this ebook will give you the history, facts and guide you through all aspects of preparation for your next walking or cycling adventure. In the ebook you will find a list of the best routes to choose from, useful phrases in Italian, the best food festivals along the way, some exercises to prepare you for long-distance walking and a short packing guide. * By downloading this free ebook you are agreeing to receive the CaminoWays.com newsletter.